Resolving dependencies between providers — for example, if one provider requires another provider. Maintaining a hierarchy of injectors so that if a component asks for a provider result from a provider not available in its injector, DI searches up the hierarchy of injectors. Figure 1: Each component has its own injector that registers providers. Injectors create child injectors and a request for a provider starts with the local injector and searches up the injector hierarchy. 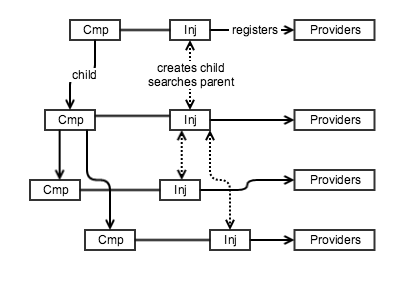 We can see from the above that while components form a downwards directed graph, their associated injectors have a two-way relationship: parent injectors create children (downwards) and when a provider is requested, Angular 2 searches the parent injector (upwards) if it can’t find the requested provider in the component’s own injector. This means that a provider with the same identifier at a lower level will shadow (hide) the same-named provider at a higher level. A class provider generates/provides an instance of the class. A factory provider generates/provides whatever returns when you run a specified function. A value provider doesn’t need to take an action to provide the result like the previous two, it just returns its value. Unfortunately, the term “provider” is sometimes used to mean both the class, function or value and the thing that results from the provider — a class instance, the function’s return value or the returned value. Let’s see how we can add a provider to a component by creating a class provider using MyClass, a simple class that will generate the instance we want to use in our application. Figure 3: Our application’s bootstrap.ts file that instantiates the root component. Figure 4: CompDemo with MyClass imported, added to the providers array and used as a Type in the constructor arguments. Add an argument of type “MyClass” to the constructor. Under the covers, when Angular instantiates the component, the DI system creates an injector for the component which registers the MyClass provider. Angular then sees the MyClass type specified in the constructor’s argument list and looks up the newly registered MyClass provider and uses it to generate an instance which it assigns to “myClass” (initial small “m”). The process of looking up the MyClass provider and generating an instance to assign to “myClass” is all Angular. It takes advantage of the TypeScript syntax to know what type to search for but Angular’s injector does the work of looking up and returning the MyClass instance. Given the above, you might conclude that Angular takes the list of classes in the “providers” array and creates a simple registry used to retrieve the class. But there’s a slight twist to make things more flexible. A key reason why a “twist” is needed is to help us write unit tests for our components that have providers we don’t want to use in the testing environment. In the case of MyClass, there isn’t much reason not to use the real thing, but if MyClass made a call to a server to retrieve data, we might not want to or be able to do that in the test environment. To get around this, we need to be able to substitute within ProvDemo a mock MyClass that doesn’t make the server call. How do we make the substitution? Do we go through all our code and change every MyClass reference to MyClassMock? That’s not efficient and is a poor pattern for writing tests. This associates the token (key) MyClass with the class provider MyClassMock. When our code asked the DI system to inject MyClass in testing, we get an instance of MyClassMock which can fake the data call. The net effect is that all our code remains the same and we don’t have to worry about whether the unit test will make a call to a server that might not exist in the test environment.